German jurist and writer on ecclesiastical law; born at Marienwerder June 8, 1804; died at Königsberg March 19, 1868. 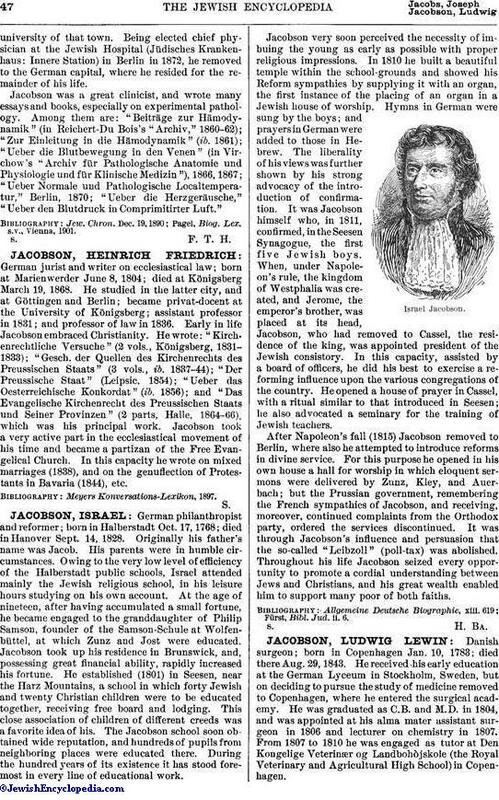 He studied in the latter city, and at Göttingen and Berlin; became privat-docent at the University of Königsberg; assistant professor in 1831; and professor of law in 1836. Early in life Jacobson embraced Christianity. He wrote: "Kirchenrechtliche Versuche" (2 vols., Königsberg, 1831-1833); "Gesch. der Quellen des Kirchenrechts des Preussischen Staats" (3 vols., ib. 1887-44); "Der Preussische Staat" (Leipsic, 1854); "Ueber das Oesterreichische Konkordat" (ib. 1856); and "Das Evangelische Kirchenrecht des Preussischen Staats und Seiner Provinzen" (2 parts, Halle, 1864-66), which was his principal work. Jacobson took a very active part in the ecclesiastical movement of his time and became a partizan of the Free Evangelical Church. In this capacity he wrote on mixed marriages (1838), and on the genuflection of Protestants in Bavaria (1844), etc.